Well, here we are at the end of March. We have less than 4 weeks to go until my goal race for this Spring racing season, the Owens Corning Half Marathon, part of the Medical Mutual Glass City Marathon. Now that we are drawing nearer to the actual big event, I think it might be beneficial to anyone who is attending to learn a little about where to go, where to stay, the course itself, where to park. I know that sort of thing is helpful to me when I am traveling to a race, even if it is in my hometown (Toledo) or where I currently live (Cincinnati). The host hotel for the race is the Ramada Inn and Conference Center, which is on Secor Rd (and fairly close to the University, where the start and finish are located!). They are offering rooms to marathon participants (and their families) for $82/night. This rate is only available until April 4, so if you are planning on booking one, you only have a few days left! 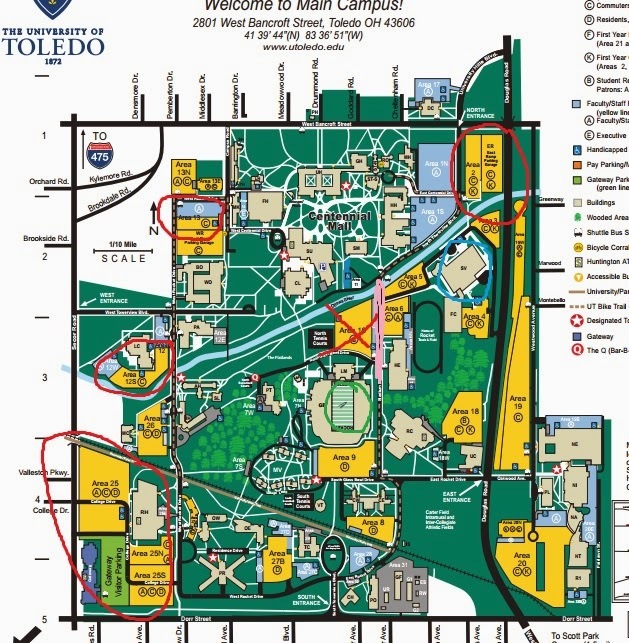 As far as the expo and parking are concerned, the easiest way to show you is to show a campus map. Red is parking. Circles are good places to park (I always park up in area 2, myself) and the red "x" is a no parking section - as that is where the the post race celebration will be set up! The green circle is the Glass Bowl, that is where the finish line is located with the pink line right next to it (the start line for all races!). The blue circle is Savage Arena, where the expo and packet pick up will take place. Now, here is some advice that I need to take myself, since I have now run this race for two straight years, and I have not managed to get it through my head. Leave early. Especially is you are going to park off of Douglas Rd (the east side of campus). Traffic gets pretty backed up there, and there are typically a lot of people parking in that garage there, so if you want time to warm up and stretch before the race, I recommend leaving yourself plenty of time. Or you should check on what time the race actually starts so you are not hanging out in your car until the start (whoops, did that last year). Navigation around campus is pretty easy, and there is plenty of parking, just be sure to allow yourself enough time! Any logistics questions? Let me know, and if I don't have the answers, I will get them for you!